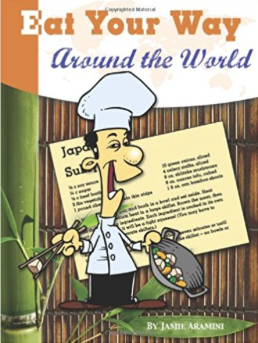 Eat Your Way Around the World is a cookbook containing recipes for complete meals from countries all over the world. Each recipe has been adapted for use with readily available and affordable ingredients. In addition to recipes, the book is full of fun cultural information, food trivia, and etiquette hints. One of my favorite features of the book is the Passport. In the Appendix, you will find a passport and passport stamps that you can copy. You can create a passport for each of their children and let them put a stamp in it every time they “visit” a new country by eating the food. Read a sample from Eat Your Way Around the World (Morocco). This book is a revision I’ve done of Teaching Geography Through Art by Sharon Jeffus. It makes a great companion to Eat Your Way Around the World. 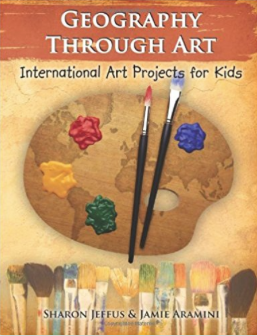 It contains art projects from dozens of countries, with new illustrations done especially for this edition of the book. The projects cover all skill and age levels. If you have the original version of the book, I think you will find the new edition a huge improvement, with a beautiful, easy-to-read layout. Read a sample from Geography Through Art (part of Africa). Although he’s just two part hydrogen and one part oxygen, Munford is all adventure. He can be rain, snow, sleet, or steam. He has traveled the world in search of excitement. Throughout history, he has been present at some of the most important and world-changing events. Fun and educational, Munford will inspire your children to learn more about many of history’s greatest moments. These readers make a great addition to your learning experience in areas such as history, geography, and science. This book series is written on an elementary reading level, but provides plenty of read-aloud entertainment for the entire family. There are four titles so far in this series. Follow Munford as he joins the Corps of Discovery for one of the most epic journeys in American history. Meet famed explorers Lewis & Clark, as well as Sacagawea and the expedition dog, Seaman. 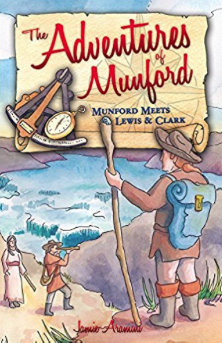 In this adventure, Munford travels to Colonial America and experiences first hand the events leading to the American Revolution. He meets famed American Founding Fathers, such as Samuel Adams, Thomas Jefferson, and George Washington. He joins the Sons of Liberty under cover of night to dump tea into Boston Harbor. He tags along for Paul Revere’s most famous ride, and even becomes a part of the Declaration of Independence in a way that you might not expect! Read Chapter 1 of Munford & the American Revolution. In this book, Munford finds himself slap into the middle of the Klondike Gold Rush. He catches gold fever on this dangerous and thrilling adventure. Meet some of the Gold Rush’s most famous characters, like gold baron Alex McDonald or the tricky villain named Soapy Smith. Take a ride on the Whitehorse Rapids, and help Munford as he pans for gold. It’s an adventure you won’t soon forget! Read Chapter 1 of Munford & the Klondike Gold Rush. In this tale of adventure, Munford meets a young boy in colonial America with a knack for inventing. The boy grows up to become one of the world’s leading inventors, Robert Fulton! Join Munford and Fulton as they race to create the world’s first commercially successful steamboat. Along the way, you’ll meet a colorful cast of characters, from Benjamin Franklin to Napoleon Bonaparte. Don’t miss this exciting story as it takes you from a fledgling young nation, to the rivers of France, and back again! Read Chapter 1 of Munford Meets Robert Fulton.